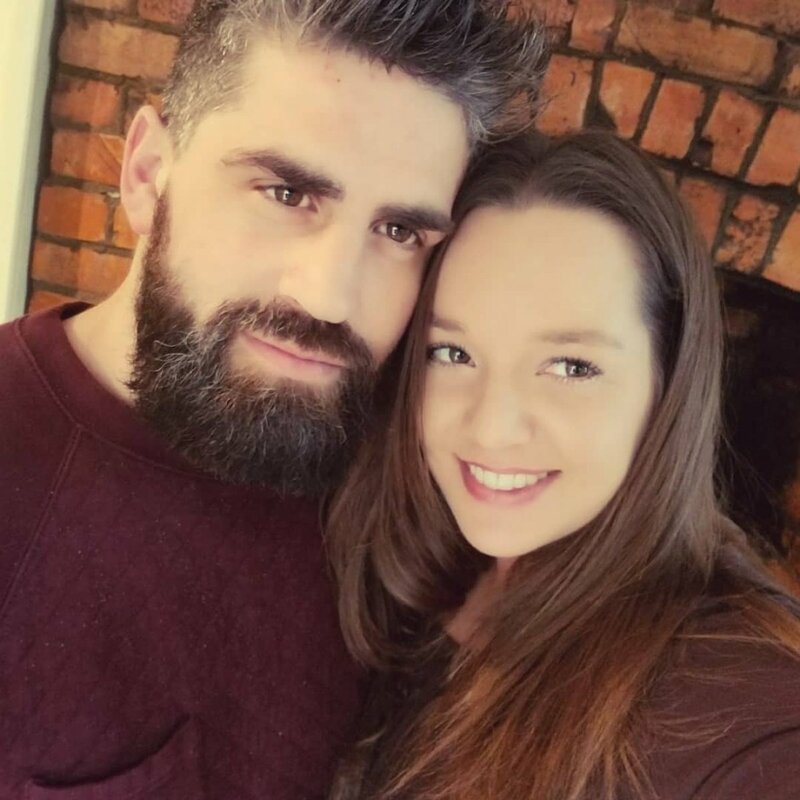 90 Day Fiance couple Rachel Bear and Jon Walters are giving the impression they're crazy about each other and that the honeymoon stage will never subside for them. Rachel, a 33-year-old from Albuquerque, New Mexico, and Jon, a 34-year-old from England, star on Season 2 of 90 Day Fiance: Before the 90 Days. After getting to know each other for a year-and-a-half over the phone and video chat, they finally met in person for the first time in England in December 2017, although the 90 Day Fiance season just premiered on August 5. "If romance makes you feel sick, then there's no use in watching because this is going to get cranked up," Jon told Good Housekeeping in a recent interview. "Romeo and Juliet will have nothing on us." While the couple's relationship is currently going strong on the show and they continue to fall for each other, Rachel admitted, "We cannot confirm that we're still together." [Spoiler Warning: Please stop reading now if you don't want to find out how Jon and Rachel's relationship turned out]. However, all signs point to the fact Jon and Rachel are still an item, especially since a marriage license surfaced showing Jon and Rachel tied the knot on May 31, 2018 at BoHo Cornwall, a wedding venue in the U.K. that specializes in elopements. "I'm not saying what the outcome is, but I would [travel back and forth] forever," Rachel said. "Let's be honest... I would move anywhere. I'd go live in Mexico [to be with her]. It doesn't bother me," Jon agreed. It would make sense for Rachel and Jon to have exchanged vows in England because the U.S. government had already previously denied Jon a K-1 visa -- the visa that the 90 Day Fiance franchise's overseas participants typically use to come to the United States -- to come to America due to his criminal record. "At the time, we thought that I was going to come to America. That whole year was a really tough. It was a really tough year. I couldn't get to America," Jon told Good Housekeeping. "So, Rachel decided it was time for her to go to England." Jon's criminal record apparently includes a couple of physical altercations, though details have not been disclosed on the show. "[My friends and I] checked online to see if he's ever been violent against a woman. [Under] Clare's Law [regarding domestic abuse in the U.K.], you can search anybody's name and it will give you everything about them. I was not worried because I felt like I had known him for a lifetime. It's hard to explain, but when you know, you just know," Rachel explained. Jon also stepped up to the plate to care for Rachel's infant daughter, Lucy. But Because Rachel also has an eight-year-old daughter, Ella, at home in New Mexico, the mom revealed she would never move out of the United States. "I will not leave her. It's a custody thing," Rachel noted, adding that she is "not willing" to talk about Lucy's biological father because "it just doesn't matter" and the situation is "a really personal thing." In addition to Jon's criminal record, he and Rachel faced another speed bump in their romance during her first trip to England. As viewers saw on the show, Jon's sister accused him of having so many ex-girlfriends that she can't keep track of them. "Why the f-ck would you tell my fiance about me dating other girls? What are you even talking about? My sister is an idiot," Jon vented. But Rachel said she's "not mad" at anybody and understands why Jon's sister was skeptical at first. "If I wasn't in this situation, I wouldn't understand it either. Jon dated, but guess what? I did, too. I have two kids. Clearly, I've had my dates. We've all been there, but I find that my family won't necessarily point that out to Jon in front of me, so that was a little uncalled for," Rachel explained. 90 Day Fiance: Before the 90 Days currently airs on Sunday nights at 8PM ET/PT on TLC. 'Big Brother's Scottie Salton's vulgar eviction speech: What did he say about Tyler Crispen and Angela Rummans?